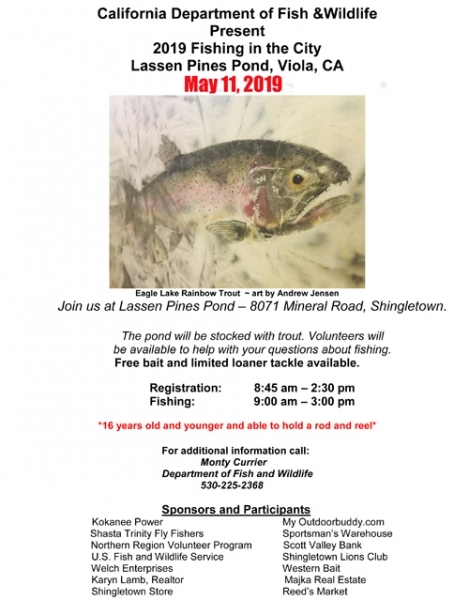 In conjunction with California Department of Fish and Wildlife, Shingletown Lions Club, Shasta Trinity Fly Fishers and Lassen Pine Christian Camp “Kids Fish Day” will be conducted at Lassen Pine Christian Camp at Viola. Fishing from 9:00 AM till 3.00 PM on May 11, 2019. Great fishing for kids 16 years and younger and able to hold a rod and reel. There is a two fish limit. No artificial lures may be used. Kids may bring their own tackle, worms and power bait. Worms and some power bait will be available at the lake with no charge to the kids. Also, there will be loaner tackle. Adults must provide ID and sign for the tackle to insure that it is returned. Registration is required of all kids. For details on the event log on to Shingletown.com or call Monty Currier, Department of Fish and Wildlife (530) 225-2368 or R. L. “Stew” Stewart, Shingletown Lions Club (530) 474-5748. View PDF Poster or Text.